Death follows a young group of friends in the deceptively quiet town of Hinamizawa. In the summer of 1983, despite trying their best to avoid disaster, the girls continue to experience terrible conflicts which, inevitably, rack up the body count. In a desperate attempt to save their lives, Rika Furude works with a spirit named Hanyuu to discover the truth behind the calamities. Return to Hinamizawa in When They Cry Season 2. In the year 2007, Mamoru Asakasa returns to a Hinamizawa decimated by the gas leak that killed nearly the entire populace. In another iteration of 1983, Keiichi once more learns about Oyashiro’s Curse from Tomitake and Takano, this time also with Irie. Rika worries as the festival approaches. Satoko tries to get Rika out of her depression, but her friend won’t admit her fears. That night, Rika argues with a mysterious voice regarding her fate. 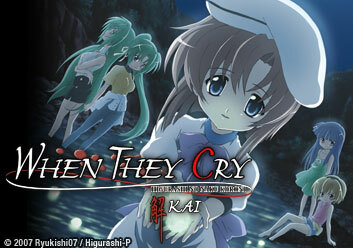 The day of the festival dawns, and Satoko is paranoid that she and Rika are being followed. Is she right? Satoko flees in terror and has an accident. Injured, she witnesses the Great Hinamizawa Disaster, which sends her into shock. A new world comes with the possibility for changing fate. Keiichi may just prove it as he makes a different choice that has multiple effects. With Keiichi’s success, Rika finds that her friends are beginning to avoid making the same mistakes, and she opts to discover a way to fight her own fate. Teppei’s appearance may throw everything into disarray as he begins to abuse Satoko again. The group tries to find a way to help her. Despite Satoko’s reluctance to help because of Teppei’s particular blackmail, her friends continue to fight for her freedom. Keiichi desperately appeals to the village leaders to aid Satoko, including the head of the Sonozaki family. The group finally gets Satoko to reveal her abuse and the police step in. As the festival begins, Rika tries to save Tomitake and Takano, only to discover the true culprit. Rika explains the Hinamizawa Syndrome and the clinic’s position on the topic. Rika reveals more about the significance of her lineage and why she’s being targeted. Rika and Hanyuu discuss Rika’s fate, and subsequently the fate of the village, only to conclude that Hanyuu must also desire an end to the cycle. The spy within the Yamainu is compromised, and the first daring stage of the plan is put into motion. The way Takano discovered her grandfather is revealed, alongside her ascension into academic and intellectual circles. The dam incident is revealed in detail, including the initial confrontation between the Sonozaki and Houjou families. With the desire to save Satoko, Rika makes a valiant decision. When Rika’s parents object, Takano utilizes the Oyashiro Curse to her advantage. The Maebara family moves in, as does Rena’s. Satoshi disappears, but this time, as Mion’s grandmother discusses burying the hatchet, things seem to be looking up. Hanyuu transfers into the school and remembers the mastermind behind the eventual demise of Hinamizawa. With the culprit unmasked, the group decides to plan a counter attack, including the faking of Rika’s death. As Dr. Irie tries to escape his would be captors, he inadvertently may cause the collapse of the plan as a whole. The Yamainu close in on the Sonozaki estate, and a small group tries to rescue Tomitake with a slim chance of success. Akasaka and Tomitake call on the Benken combat unit to detain Takano and the Yamainu. Unwilling to give in, Takano flees into the mountains, only to meet Rika and her friends.